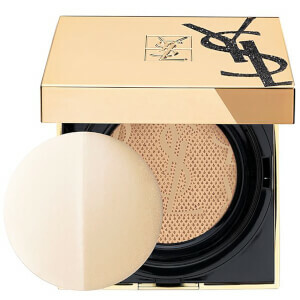 Achieve a flawless canvas with the Yves Saint Laurent Touche Éclat Le Cushion Foundation; a fresh, blendable cushion foundation that offers buildable and customisable radiance and coverage. Arriving in a sleek, gold mirrored compact, the formula is enriched with an antioxidant-packed moisturising complex and seamlessly hugs skin with a longwearing ‘naked’ feel. 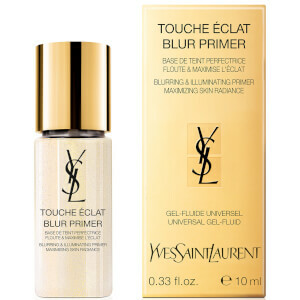 Delivering the natural-looking result of a liquid foundation with the ease and practicality of a compact, the refillable foundation is a must-have. For en naturlig finish: Påfør over det hele med side (1) av applikatoren. Sveip over ansiktet. For en intens finish: Påfør over hele ansiktet med side (2) ved å trykke den mot ansiktet. Aqua / Water, Cyclopentasiloxane, Phenyl Trimethi- Cone, Isononyl Isononanoate, Alcohol Denat, Peg-10 Dimethicone, Glycerin, Bis-Peg/Ppg-14/14 Dimethicone, Synthetic Fluorphlogopite, Phenoxyethanol, Magnesium Sulfate, Ethylhexyl Hydroxystearate, Disteardimonium Hectorite, Silica, Disodium Stearoyl Glutamate, Dimethicone, Tocopheryl Acetate, Aluminum Hydroxide, Ruscus Aculeatus Root Extract, Tin Oxide, Benzyl Alcohol, Linalool, Parfum / Fragrance, [+/- May Contain: Ci 77891 / Titanium Dioxide , Ci 77491, Ci 77492, Ci 77499 / Iron Oxides, Ci 77163 / Bismuth Oxychloride, Mica], (F, I, L, B190373/1). Please note ingredients may vary with shade.